We are glad that we managed to create a category of My Little Pony Movie Games, since we will make sure to bring you all of the available games based on this film, games we have no doubt at all you will enjoy a lot, like you get to enjoy games only on our amazing website! The My Little Pony Movie Games category was created in 29.09.2017 and from there we added more than 3 games for boys and girls that are interested in gaming online. These games were voted in total 23 times and the best game from My Little Pony Movie Games it's Pony Maker and Adventure Taker. 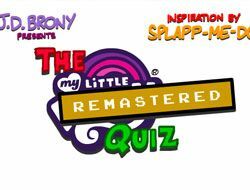 We recommend you to play the latest game added in this category on 07.01.2018 which it's The My Little Pony Quiz: Remastered. If you want My Little Pony Movie Games, just click here. My Little Pony Movie Games, or My Little Pony The Movie Games is one of the latest categories of My Little Pony Games we have created for our website, where we already have a category of games made for the characters in this franchise, but since this movie is going to be separate, and it is going to include a new cast for the characters, we thought it would be appropriate to create a wholly different page for these games, since we are sure that prior to the release of the movie, during it’s run in cinemas, and after that, the number of games based on the movie is going to be big, so we want to be able to have a place to share them all with you. Of course, all of the games from this page are also going to be found in the My Little Pony Games category, because that will be the place where all things related to this franchise are goin to be found. After the success of the dolls and toys, which is where this franchise originated, 2010 was the year when the animated series with My Little Pony: Friendship is Magic began, and since then it only became more and more popular. There is also a spin-off animated series, Equestria Girls, which re-imagines the characters as human girls, and plenty of movies with this version of the characters have already been made. Considering how popular this world has become, and how many fans it managed to get in this time, it was not surprising at all when we found out that Hollywood is producing a feature film, animated, of course, based on it, and 2017 is the year when we finally see these characters on the big screen, with a whole new adventure for all of us. Since the movie is certainly going to prove to be popular, we are sure that the My Little Pony Movie Games are going to prove popular as well, which is why we are happy we created this page. If you are already a fan of this franchise, then you will certainly go in the cinemas and watch the movie, and then play the games on this page. If you are not, and maybe never heard about this world before, then you could continue reading this description, because from it you are going to learn what this movie is all about, and what kinds of My Little Pony Movie Games you will be able to find and play, which is something you are certainly interested about. A threat is putting all of Equestria, the place where these ponies live, in danger, so Twilight Sparkle, a flying pony, and the main character, together with her friends - Applejack, Rainbow Dash, Pinkie Pie, Fluttershy, Rarity, and of course, their pet dragon, Spike, are going to have to journey outside of Ponyville, embark on an amazing and exciting new adventure beyond their home, where they are not only going to have to face all sorts of interesting challenges in order to stop the threat to Equestria, but they are also going to meet and make all sorts of new friends. Doesn’t this sound really interesting? We think that the premise they chose for the movie is one that goes very well with what we have seen prior of this franchise, and it is going to satisfy both the older fans, who love this world already, but it is also going to certainly impress a lot of newcomers, who, after seeing the movie, are definitely going to become fans of this franchise. The first game we have added in the My Little Pony Movie Games category is a game called Pony Creator, where you have the chance to create a pony of your own making, using the options available to make it look however you want to, something which we are sure you will have lots of fun doing. Of course, more games are going to follow as well, of all sorts, for sure, and we have no doubt at all that no matter what games you choose to play, you are going to have a really enjoyable time doing it. Now, do not forget to tell your friends about this category of My Little Pony Movie Games, because they will certainly be happy to find these games and play them, and they will be thankful to you for showing them our website. When you are done playing My Little Pony Games, we invite you to check out the many other categories we have on our website, as we have lots of them, all filled with one great game after the other, so one thing is certain, you can never get bored while playing games on our website!